AWS is the biggest player in the public IaaS (Infrastructure as a Service) market and a critical component of the hybrid-cloud infrastructure in many enterprises. Understanding how to secure AWS resources and minimize the impact of any breaches that do occur has become more important than ever. For this reason, after closing 2018 with Infection Monkey & GuardiCore Centra’s integration into AWS Security Hub, we decided to open 2019 with a crash course on AWS security best practices. In this piece, we’ll dive into some of the basics of AWS security, provide some tips to help you get started, and supply you with information on where you can learn more. AWS is responsible for “security of the cloud”- This means select software, hardware, and global infrastructure (think racks in physical data centers, hypervisors, switches, routers, storage, etc.) are AWS’s responsibility to secure. Customers are responsible “for security in the cloud”- This means customers are responsible for ensuring things like customer data, applications, operating systems, firewalls, authentication, access management, etc. Worded differently, AWS gives you the public cloud infrastructure to build upon, but it’s up to you to do so responsibly. It is expected that not everything you need will be baked into any given AWS solution. Third-party security tools like Centra can help fill those gaps. Understanding the shared responsibility model and what tools can help will allow you to ensure you’re doing your part to secure your infrastructure. Grant least privilege – The principle of least privilege is a popular concept in the world of InfoSec and it is even more important to adhere to in the cloud. Only grant users and services the privileges necessary for the given set of tasks they should be legitimately responsible for, and nothing more. Use IAM groups – Using groups to assign permissions to users significantly simplifies and streamlines access management. Regularly rotate credentials – Enforcing expiration dates on credentials helps ensure that if a given set of credentials is compromised, there is a limited window for an attacker to access your infrastructure. Limit use of root – Avoid using the Linux “root” user. Being conservative with your use of root access helps keep your infrastructure secure. Use MFA – Multi-factor authentication (MFA) should be considered a must for users with high-level privileges. SSH keys are less susceptible to brute force attacks than passwords. To compromise SSH public-key authentication used with a passphrase, an attacker would need to obtain the SSH private-key AND determine (or guess) the passphrase. While SSH keys may require a little more work when it comes to key management, the pros far outweigh the cons from a security perspective. First, to clear up a common misconception: AWS security groups are NOT user groups or IAM groups. An AWS security group is effectively a virtual firewall. If you’re comfortable understanding the benefits of a firewall within a traditional network infrastructure, conceptualizing the benefits of AWS security groups will be intuitive. Now that we’ve clarified what a security group is, we’ll dive into a few AWS security group best practices to help you get started using them. Minimize open ports – Unless there is a highly compelling argument to do so, only allow access to required ports on any given instance. For example, if you’re running a cluster of instances for a web-server, access to TCP ports 80 and 443 makes sense (and maybe 22 for SSH), but opening other ports is an unnecessary risk. Don’t expose database ports to the Internet – In most cases, there is no need to expose the database to the Internet – doing so puts your infrastructure at risk. Use security group policies to restrict database port (e.g. TCP 3306 for MySQL) access to other specific AWS security groups. Regularly audit your security group policies – Requirements change, rules that were once needed become liabilities, and people make mistakes. Regularly auditing your security rules for relevance and proper configuration help you minimize the likelihood that an outdated or misconfigured security group creates a network breach. This is just the tip of the iceberg when it comes to AWS security group best practices. For more information, check out the AWS Security Groups User Guide and our Strategies for Protecting Cloud Workloads with Shared Security Models whitepaper. One of the most important components of securing public-cloud infrastructure, particularly in hybrid-cloud environments, is micro-segmentation. Micro-segmentation helps limit both north-south and east-west movement of breaches when they occur, which helps mitigate the spread of threats from one node to another. Further, Guardicore’s intelligent micro-segmentation solution can limit one of the biggest drivers of breach impact: dwell time. If you’re interested in learning more, check out this blog post for a crash course on micro-segmentation best practices. Enhanced visibility – Centra is able to automatically discover applications and flows, use its AWS API integration to pull labels and asset information, and provide granular visibility and baselining for your entire infrastructure. Application aware policies- Next Generation Firewalls (NGFWs) are a big part of on-premises security, and Centra helps bring the same features to your AWS cloud. You wouldn’t compromise on application-aware security in a physical datacenter, and with Centra you don’t have to in the cloud either. Protection across multiple cloud platforms & on-prem- It is common for the modern enterprise to have workloads scattered across multiple cloud service providers as well as physical servers on-premises. Centra is able to provide micro-segmentation for workloads running in AWS, other IaaS providers, and on physical servers in corporate offices and data centers. This helps enterprises ensure that their security is robust across the entirety of their infrastructure. If you’re interested in learning more about the benefits of Centra for AWS, check out this solution brief (PDF). As we have seen, there is no single magic bullet when it comes to securing your AWS infrastructure. Understanding the AWS shared responsibility model enables you to know where to focus your attention, and leveraging built-in AWS features like security groups and IAM are a great start. However, there are still gaps left unaccounted for by AWS tools, and 3rd party solutions are needed to address them. Guardicore Centra provides users with micro-segmentation, breach detection & response, and application-level visibility that help round out a holistic approach to AWS security. For more on how Guardicore Centra and micro-segmentation can help you keep your AWS resources secure, contact us today or sign up for a demo of the Centra Security Platform. Interested in cloud security for hybrid environments? Get our white paper about protecting cloud workloads with shared security models. Gartner has recently updated the micro-segmentation evaluation factors document (“How to Use Evaluation Factors to Select the Best Micro-Segmentation Model (Refreshed: 5 November 2018). This report details the four different models for micro-segmentation, but it did not make a clear recommendation on which was best. Understanding the answer to this means looking at the limitations of each model, and recognizing what the future looks like for dynamic hybrid-cloud data centers. I recommend reading this report and evaluating the different capabilities, however for us at Guardicore, it is clear that one solution model stands above the others and it should not be a surprise that vendors that have previously used other models are now changing their technology to use this model: Overlay. But first, let me explain why other models are not adequate for most enterprise customers. The native model uses the tools that are provided with a virtualization platform, hypervisor, or infrastructure. This model is inherently limited and inflexible. Even for businesses only using a single hypervisor provider, this model ties them into one service, as micro-segmentation policy cannot be simply moved when you switch provider. In addition, while businesses might think they are working under one IaaS server or hypervisor, the provider may have servers elsewhere, too, known as Shadow IT. The reality is that vendors that used to support Native controls for micro-segmentation have realized that customers are transforming and had to develop new Overlay-based products. More commonly, enterprises know that they are working with multiple cloud providers and services, and need a micro-segmentation strategy that can work seamlessly across this heterogeneous environment. This model is based on virtual firewalls offered by third-party vendors. Enterprises using this model are often subject to network layer design limitations, and therefore forced to change their networking topology. They can be prevented from gaining visibility due to proprietary applications, encryption, or invisible and uncontrolled traffic on the same VLAN. A known issue with this approach is the creation of bottlenecks due to reliance on additional third-party infrastructure. Essentially, this model is not a consistent solution across different architectures, and can’t be used to control the container layer. A combination of the above two models, enterprises using a hybrid model for micro-segmentation are attempting to limit some of the downsides of both models alone. To allow them more flexibility than native controls, they usually utilize third-party firewalls for north-south traffic. Inside the data center where you don’t have to worry about multi-cloud support, native controls can be used for east-west traffic. However, as discussed, both of these solutions, even in tandem, are limited at best. With a hybrid approach, you are also going to add the extra problems of a complex and arduous set up and maintenance strategy. Visibility and control of a hybrid choice is unsustainable in a future-focused IT ecosystem where workloads and applications are spun up, automated, auto-scaled and migrated across multiple environments. Enterprises need one solution that works well, not two that are sub-par individually and limited together. Rather than a patched-together hybrid solution from imperfect models, Overlay is built to be a more robust and future-proof solution from the ground up. Gartner describes the Overlay model as a solution where a host agent or software is enforced on the workload itself. Agent-to-agent communication is utilized rather than network zoning. One of the negative sides to third-party firewalls is that they are inherently unscalable. In contrast, agents have no choke points to be constrained by, making them infinitely scalable for your needs. With Overlay, your business has the best possible visibility across a complex and dynamic environment, with insight and control down to the process layer, including for future-focused architecture like container technology. The only solution that can address infrastructure differences, Overlay is agnostic to any operational or infrastructure environments, which means an enterprise has support for anything from bare metal and cloud to virtual or micro-services, or whatever technology comes next. Without an Overlay model – your business can’t be sure of supporting future use cases and remaining competitive against the opposition. It’s clear that Overlay is the strongest technology model, and the only future-focused solution for micro-segmentation. This is true for traditional access-list style micro-segmentation as well as for implementing deeper security capabilities that include support for layer 7 and application-level controls. Unfortunately, not every vendor will provide the best version of Overlay, meeting the functionality that its capable of. Utilizing the inherent benefits of an Overlay solution means you can put agents in the right places, setting communication policy that works in a granular way. With the right vendor, you can make intelligent choices for where to place agents, using context and process level visibility all the way to Layer 7. Your vendor should also be able to provide extra functionality such as enforcement by account, user, or hash, all within the same agent. Remember that protecting the infrastructure requires more than micro-segmentation and you will have to deploy additional solutions that will allow you to reduce risk and meet security and compliance requirements. Micro-segmentation has moved from being an exciting new buzzword in cyber-security to an essential risk reduction strategy for any forward-thinking enterprise. If it’s on your to-do list for 2019, make sure you do it right, and don’t fall victim to the limitations of an agentless model. Guardicore Centra provides an all in one solution for risk reduction, with a powerful Overlay model that supports a deep and flexible approach to workload security in any environment. Want to learn more about the differences between agent and agentless micro-segmentation? Check out our recent white paper. A major vulnerability related to containers was released on Feb 12th. The vulnerability allows a malicious container that is running as root to break out into the hosting OS and gain administrative privileges. Adam Iwanuik, one of the researchers who took part in the discovery shares in detail the different paths taken to discover this vulnerability. Use Docker containers with SELinux enabled (–selinux-enabled). This prevents processes inside the container from overwriting the host docker-runc binary. Use read-only file system on the host, at least for storing the docker-runc binary. Use a low privileged user inside the container or a new user namespace with uid 0 mapped to that user (then that user should not have write access to runC binary on the host). The first two suggestions are pretty straightforward but I would like to elaborate on the third one. It’s important to understand that Docker containers run as root by default unless stated otherwise. This does not explicitly mean that the container also has root access to the host OS but it’s the main prerequisite for this vulnerability to work. echo "List of containers running as root"
In any case, as a best practice you should prevent your users from running containers as root. This can be enforced by existing controls of the common orchestration\management system. For example, OpenShift prevents users from running containers as root out of the box so your job here is basically done. However, in Kubernetes your can run as root by default but you can easily configure PodSecurityPolicy to prevent this as described here. In order to fix this issue, you should patch the version of your container runtime. Whether you are just using a container runtime (docker) or some flavor of a container orchestration system (Kubernetes, Mesos, etc…) you should look up the instructions for your specific software version and OS. Guardicore provides a network security solution for hybrid cloud environments that spans across multiple compute architectures, containers being one of them. Guardicore Centra is a holistic micro-segmentation solution that provides process-level visibility and enforcement of the traffic flows both for containers and VMs. This is extremely important in the case of this CVE, as the attack would originate from the host VM or a different container and not the original container in case of a malicious actor breaking out. Guardicore can mitigate this risk by controlling which processes can actually communicate between the containers or VMs covered by the system. Micro-segmentation is the way forward in protecting networks. But a successful micro-segmentation deployment cannot be slapped together – it requires deliberate and detailed forethought in order to get it all right — the first time around. 148 million consumers were affected by the Equifax Data Breach in 2017, more than half of all American adults. The US House of Representatives recently published an extensive report that allows the public to see what happened throughout the attack step by step, the techniques the attackers used to penetrate, move laterally, and gain access to valuable information, and how they managed to achieve this without being detected. Significantly, the report discusses what could have been done to prevent the extent of the damage. So, what went wrong for Equifax? With a breach of this scale, it would be easy to assume that the attackers used a complex attack pattern or took advantage of a new vulnerability that flew under the public radar. Interestingly, the committee outlines basic steps that Equifax failed to put into place that could have prevented the breach and limited its impact. In particular, the report mentions “the company’s failure to implement basic security protocols, including file integrity monitoring and network segmentation” as an insight into how Equifax “allowed the attackers to access and remove large amounts of data.” Without these in place, the attack lasted 76 days, and attackers were able to use the unprotected credentials they found to access 48 additional databases. The attack was only stopped because the company updated an expired security certificate, one of more than 300 they had failed to update. The limitations of Equifax’s security protocol were not due to a lack of in-depth tools or the company failing to upgrade to the latest expensive or cutting-edge technology. Many weaknesses could have been improved or even solved with security measures that are often cited by various industry standards and cybersecurity experts. 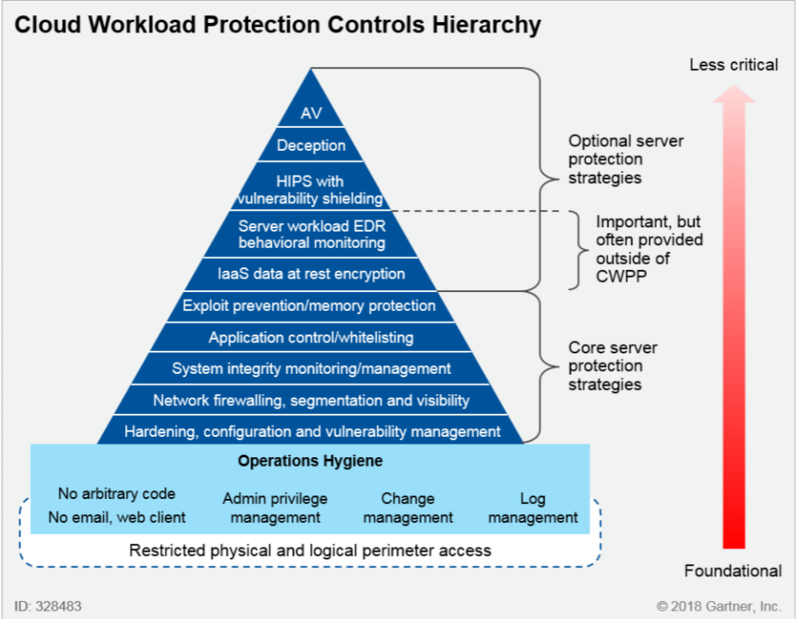 Below, you can see an informative pyramid by Gartner that details the protection controls that an enterprise needs when handling cloud workloads in a dynamic environment. The top point of the pyramid references what Gartner refer to as less critical technology, and as the pyramid widens, the tools become increasingly essential as a foundation for cloud workload protection. The “optional” top section includes Antivirus and deception tools. The middle section contains controls that are often included outside of cloud workload protection, such as encryption and monitoring. The bottom section is the most essential, and Gartner goes as far as to label these tools core server protection strategies, foundational to a cloud workload environment. System integrity monitoring, vulnerability management, and segmentation and application control all play central roles in this category. It’s not only Gartner who considers these controls essential. When it comes to protecting valuable customer information and achieving regulatory compliance, organizations such as PCI-DSS and SWIFT recommend the same basic steps. For financial information, PCI-DSS regulations enforce file integrity monitoring on your Cardholder Data Environment itself, to examine the way that files change, establish the origin of such changes, and determine if they are suspicious in nature. SWIFT regulations require customers to “Restrict internet access and protect critical systems from the general IT environment” as well as encourage companies to implement internal segmentation within each secure zone to further reduce the attack surface. Equifax’s lack of a well implemented segmentation strategy allowed attackers to gain access to additional databases that contained Personally Identifiable Information. Without drawing attention to their activity, these hackers managed to access and remove large amounts of data held in dozens of different databases. It’s not a coincidence that the same steps to mitigate these threats are suggested so widely- from industry experts like Gartner analysts to regulatory authorities such as SWIFT and PCI. Vulnerability management and system hardening reduce the risk of being breached in the first place, while segmentation limits the impact that a breach could have if successful. Similar recommendations are coming from all directions. Implementing these basic steps significantly and measurably reduces the risk to protect your data center, starting with your business’s most critical assets. The real question is, why aren’t businesses putting these steps into place? One answer is the growing complexity of IT environments. Take the SWIFT regulations for example. Even identifying the assets that belong in a secure zone can be tough in a large financial institution that may have hundreds of components to track. Some of these are physical, while others might be virtual. They are increasingly hosted on varying kinds of architecture and could be spread across different locations and teams. Gaining visibility of an increasingly complex and dynamic ecosystem is a must before you can put any policy or controls into place, and yet the visibility itself can be a sticking point for many businesses, even before they start considering smart segmentation strategy. At Guardicore, we recognize how important it is to put these foundational controls in place, making it harder for attackers to gain entry to your environment and reducing the impact of an attack, limiting dwell time to minutes rather than days. That’s why we start with visibility, making it easier to enforce policy in the right places. A clear map of every asset and its dependencies allows businesses to create secure boundaries, track communication within the data center, as well as identify flows between the data center and the rest of the network. It’s unlikely that the Equifax team were not aware of the benefits of these controls. As we’ve seen, these protocols are recommended by experts and even required for various types of compliance. However, knowing is one thing and implementing is another. These steps are some of the first suggestions we put on the roadmap as we partner with new customers, but we’re often met with trepidation. They tell us for example that their past experiences with traditional segmentation tools have shown them to be slow and expensive, and it’s difficult to know where to start. Guardicore Centra has evolved to tackle this challenge head on, moving away from traditional segmentation methods to provide micro-segmentation that provides foundational visibility and shows quick time to value. Our customers benefit from early wins like protecting critical assets or achieving regulatory compliance, avoiding the trap of “all or nothing segmentation” that can happen when competitors do not implement a phased approach. Our expertise allows enterprises to build this contextually superior phased approach to micro-segmentation. Risk reduction is one essential element, but at Guardicore we offer a whole package solution that includes breach detection and incident response, too, strengthening overall security posture. Micro-segmentation is not a luxury for the few. Anyone can now implement the basic security measures needed to stay protected, shield themselves from obvious security gaps, and prevent attackers from gaining unchecked access to sensitive information in a hybrid IT environment. Interested in hearing more? Get in touch for a demo. Want to learn more about operationalizing micro-segmentation for quick time to value? What’s the Difference Between a High Interaction Honeypot and a Low Interaction Honeypot? A honeypot is a decoy system that is intentionally insecure, used to detect and alert on an attacker’s malicious activity. A smart honeypot solution can divert hackers from your real data center, and also allow you to learn about their behavior in greater detail, without any disruption to your data center or cloud performance. Honeypots differ in the way that they’re deployed and the sophistication of the decoy. One way to classify the different kinds of honeypots is by their level of involvement, or interaction. Businesses can choose from a low interaction honeypot, a medium interaction honeypot or a high interaction honeypot. Let’s look at the key differences, as well as the pros and cons of each. A low interaction honeypot will only give an attacker very limited access to the operating system. ‘Low interaction’ means exactly that, the adversary will not be able to interact with your decoy system in any depth, as it is a much more static environment. A low interaction honeypot will usually emulate a small amount of internet protocols and network services, just enough to deceive the attacker and no more. In general, most businesses simulate protocols such as TCP and IP, which allows the attacker to think they are connecting to a real system and not a honeypot environment. A low interaction honeypot is simple to deploy, does not give access to a real root shell, and does not use significant resources to maintain. However, a low interaction honeypot may not be effective enough, as it is only the basic simulation of a machine. It may not fool attackers into engaging, and it’s certainly not in-depth enough to capture complex threats such as zero-day exploits. Is a High Interaction Honeypot a More Effective Choice? A high interaction honeypot is the opposite end of the scale in deception technology. Rather than simply emulate certain protocols or services, the attacker is provided with real systems to attack, making it far less likely they will guess they are being diverted or observed. As the systems are only present as a decoy, any traffic that is found is by its very existence malicious, making it easy to spot threats and track and trace an attackers behavior. Using a high interaction honeypot, researchers can learn the tools an attacker uses to escalate privileges, or the lateral movements they make to attempt to uncover sensitive data. With today’s cutting-edge dynamic deception methods, a high interaction honeypot can adapt to each incident, making it far less likely that the attacker will realize they are engaging with a decoy. If your vendor team or in-house team has a research arm that works behind the scenes to uncover new and emerging cyber threats, this can be a great tool to allow them to learn relevant information about the latest tactics and trends. Of course, the biggest downside to a high interaction honeypot is the time and effort it takes to build the decoy system at the start, and then to maintain the monitoring of it long-term in order to mitigate risk for your company. For many, a medium interaction honeypot strategy is the best balance, providing less risk than creating a complete physical or virtualized system to divert attackers, but with more functionality. These would still not be suitable for complex threats such as zero day exploits, but could target attackers looking for specific vulnerabilities. For example, a medium interaction honeypot might emulate a Microsoft IIS web server and have sophisticated enough functionality to attract a certain attack that researchers want more information about. Using a high interaction honeypot is the best way of using deception technology to fool attackers and get the most information out of an attempted breach. Sophisticated honeypots can simulate multiple hosts or network topologies, include HTTP and FTP servers and virtual IP addresses. The technology can identify returning hackers by marking them with a unique passive fingerprint. You could also use your honeypot solution to separate internal and external deception, keeping you safe from cyber threats that move East-West as well as North-South. Mitigating the risk of using a high interaction honeypot is easiest when you choose a security solution that uses honeypot technology as one branch of an in-depth solution. Micro-segmentation technology is a powerful way to segment your live environment from your honeypot decoy, ensuring that attackers cannot make lateral moves to sensitive data. With the information you glean from an isolated attacker, you can enforce and strengthen your policy creation to double down on your security overall. Understanding the differences between low, medium and high interaction honeypot solutions can help you make the smart choice for your company. While a low interaction honeypot might be simple to deploy and low risk, the real benefits come from using a strong, multi-faceted approach to breach detection and incident response that uses the latest high interaction honeypot technology. For ultimate security, a solution that utilizes micro-segmentation ensures an isolated environment for the honeypot. This lets you rest assured that you aren’t opening yourself up to unnecessary risk while reaping the rewards of a honeypot solution. https://www.guardicore.com/wp-content/uploads/2019/01/low-high-interaction-honeypot-blog-picture-resize.jpg 187 685 Igor Livshitz https://www.guardicore.com/wp-content/uploads/2019/02/guardicore-logo-white-space.png Igor Livshitz2019-01-03 00:08:162019-02-23 13:20:11What’s the Difference Between a High Interaction Honeypot and a Low Interaction Honeypot? Application discovery across all environments and application delivery technologies helps organizations achieve the best possible security protection, compliance posture, and application performance levels.